All badges include access to the entire venue for the weekend. Spectators receive the same access but may not enter any official tournaments. Please note ALL Registrations below include general seating access into the Arena Finals viewing hall. For an additional $25 listed through registration, attendees can purchase Premium “Ringside” seats to be closer to the player entrances, action and hype in a dedicated seating section. This is limited to 200 seats. Exhibit hall for casuals will also remain open on Sunday next to the Arena hall so you can make the most out of your weekend experience at CEO 2019! Please keep in mind that official tournaments may start as early as Friday June 28th at 10am EST. A final pool schedule will be posted before registration closes in June This is to ensure a smooth and comfortable weekend for all players. *Available from June 1st until June 18th when online registration closes at 11:59 pm est. As of now, there will be NO on Site Registration For CEO 2019. If you wish to compete you must register online before the June 18th Deadline. This is to ensure a smooth tournament experience for all players and staff involved! CEO reserves the right to revisit this in June and will let attendees know if any changes are made. $50 3-day badge in advance , $25 1-day single day pass while supplies last. Spectator passes allows you to enjoy CEO 2019 as an attendee but not enter any of our official tournaments. To purchase your Spectator badge for the weekend, please select it on the first page of registration then fill out your information. Please keep in mind that official tournaments may start as early as Friday June 28th at 10am EST. A final pool schedule will be posted shortly after registration closes in June This is to ensure a smooth and comfortable weekend for all players. Again tournaments may start as early as Friday at 10 am so please plan your trip accordingly. What are the CEO Fighting Game Championships? CEO 2019 Fighting Game Championships are a tournament series and convention experience for fighting game fans held annually in June. With ever increasing attendance every year, CEO has become one of the most attended fighting game events in the world. In the past few years we have had over 10,000 attendees from over 47 US States and 36 Countries from around the world. 2019 is the TENTH CEO annual event! 14+ Tournaments: CEO 2019 Features over 15 of the biggest and brightest community games today. CEO receives some of the best developer support yearly so stay tuned for major announcements leading up to the event. 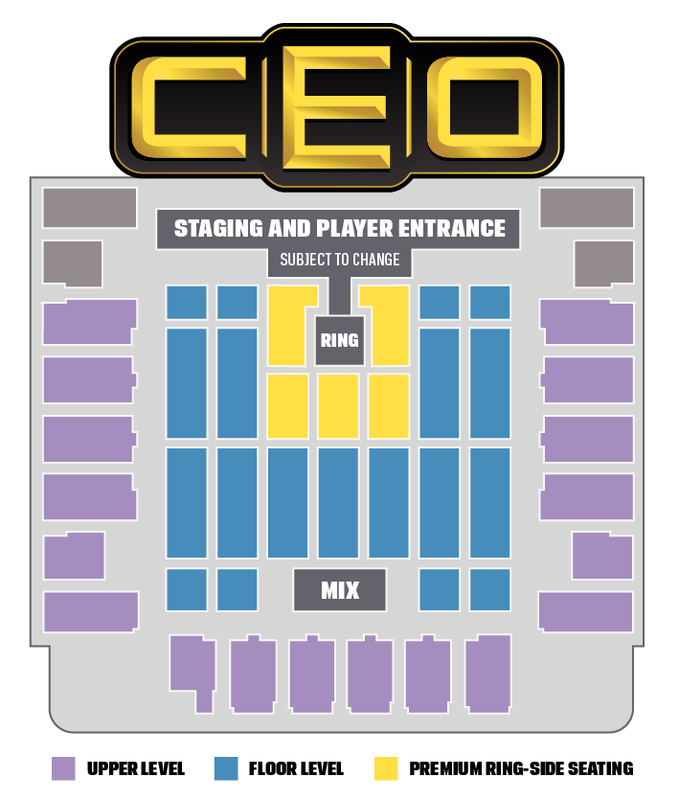 The Grandest Stage in CEO History: CEO Features a Wrestling ring stage with Top 8 Music Entrances for players to showcase their personality. Winners will receive Gold Championship Title Belts. This year the select game finals will take place inside of the Ocean Center Arena with up to 9,000 seats available. Celebrity Appearances: In recent years CEO has been visited by WWE Superstar Xavier Woods and Kenny Omega from New Japan World Wrestling. You never know who might show up to a CEO event. Multiple Streams & Stages: CEO has been prominently featured on Twitch every year involving The Capcom Pro Tour and more. Entertaining Commentary: CEO’s tournaments feature curated amateur & professional commentary for all games. Dedicated casual setups & BYOC area with side events welcome. Jebaileyland arcade is bigger and better than ever with over 60 arcade cabinets spanning fighting, rhythm and arcade classics. One of the best and biggest artist alleys in the community. Community Stick modders and custom part sales. Venue location is surrounded by many restaurants and things to do within walking distance such as the Ocean Walk Shoppes Hub. Local Restaurant discounts with your Attendee badge. The Ocean Center in Daytona Beach features a 9,000 plus seating Arena next to the 95,000 sq ft Exhibit Hall where CEO 2018 takes place. CEO 2018 is over 7 times the size of previous CEO events.